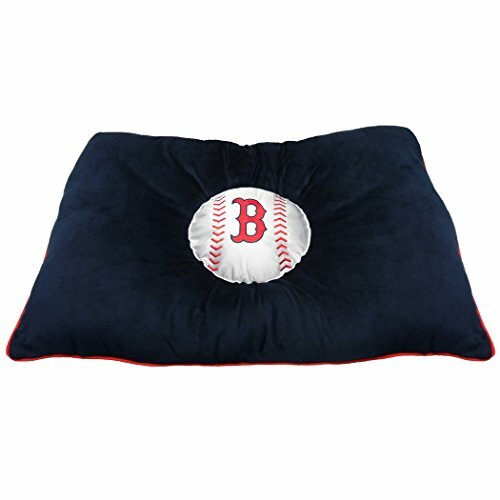 Let your pet dream of his/her favorite sports team on this officially mlb-licensed pet pillow bed designed by Pets First. This team colored pillow bed is Poly filled for your pet’s warmth and comfort. Team logos are embroidered to show off your team spirit. It is made of high end soft material to ensure durability. This pillow bed is machine washable and is made with all new materials. Your pet is surely guaranteed quality sleep with this comfortable pet pillow bed!!! – – Pets First company is an established well-known company in the sports-licensed pet product industry. Pets First’s team of unique and creative designers choose the highest quality materials and the latest technology to provide you with a durable, fashionable, comfortable and outstanding item. We follow the highest standards of safety guidelines. Pets First has gained its reputation to provide every pet owner with magnificent licensed pet products; from unique and colorful apparel items to fun and playful toys and accessories.Officially MLB Licensed pet bed! Team logo embroidered in vibrant team colors! Soft plush & poly-filled to ensure maximum comfort & pleasure for your sporty pup! Contrast trim. – baseball stitch design! Made using high end materials to GUARANTEE warmth, comfort & durability!